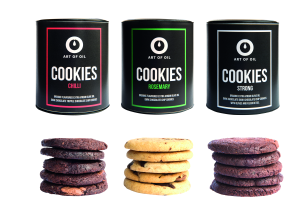 It doesn’t always have to be shortbread biscuits: knusperreich baked cookies for Art of Oil using the customer’s organic olive oil, which not only delighted passionate cookie monsters, but also the jury members of the Promotional Gift Award 2017. The culinary treats that were distinguished in the category Custom-made Designs were implemented at the BioFach trade show in Nuremberg, in order to tastefully promote the organic olive oil of Art of Oil. In the process unique biscuits in terms of taste and consistency were created using the different sorts of olive oil. Furthermore, the tins were produced to match the design of the olive oil specialists. Knusperreich exclusively uses regional, organic-certified ingredients for the cookies and – as in the case of the samples implemented for Art of Oil – ingredients that is provided by the customers. The packaging can be completely customised, among others with an individually designed tin banderole, sticker on the lid, etc. Whether for a trade show or event, as a Christmas greeting or for a product launch – the cookies are ideal for industries that place value on quality, sustainability and organic products.